Succulents are such neat little plants. They can withstand a great deal of neglect and still keep on growing. They have great flowers (if you have the right conditions and are lucky and have a green thumb) and are very interesting in their own right when it comes to shape and design. Creative succulent planters can be made out of many household items. Thinking outside the box with these Creative succulent planters. Succulents need creative planters to show them off! Not your average run of the mill plain pot, but something out of the ordinary to show case them. Here are some of my favorites. Any of the them do the sweet succulents proud! Coffee pots are not just for cups of coffee. 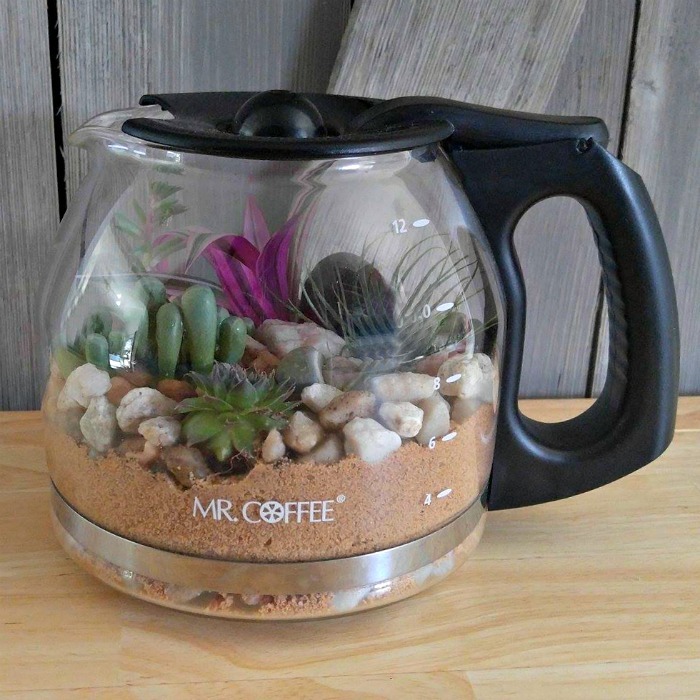 This old carafe has been turned into a coffee pot terrarium with sand, succulents and gravel. So fun and easy to do! What a cute idea! 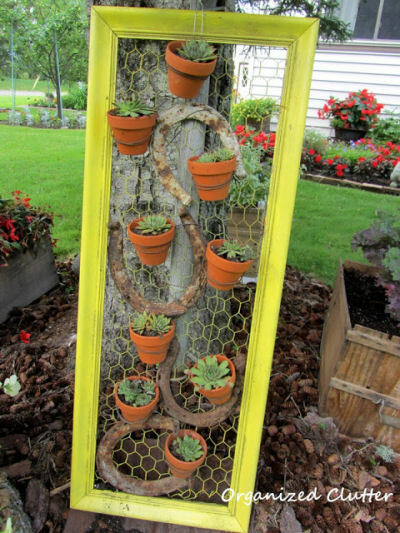 A frame, some chicken wire and terra cots pots combine to make this unique framed succulent planter. Carlene from Organized Clutter shared it with me from a tour of her sisters yard. See the whole tour at Organized Clutter. These brick succulent planters could not be easier to make. Just grab a bunch of bricks with two holes in them. 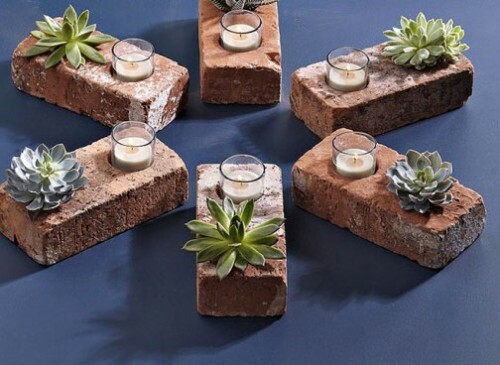 Add some dirt to one hole and pop in a succulent and place a small candle in the other hole. Idea shared from Apartment Therapy. 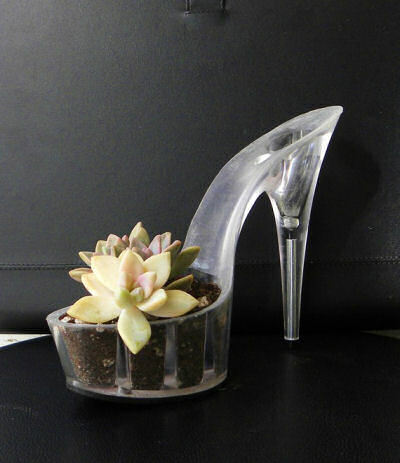 Got an old clear stiletto heel that you are tired of wearing? Don’t throw it away. It makes a neat succulent planters. The toe area is a perfect size to contain these small plants. This one is available on Etsy by Giddy Spinster for $55 but they look so easy to do as well. 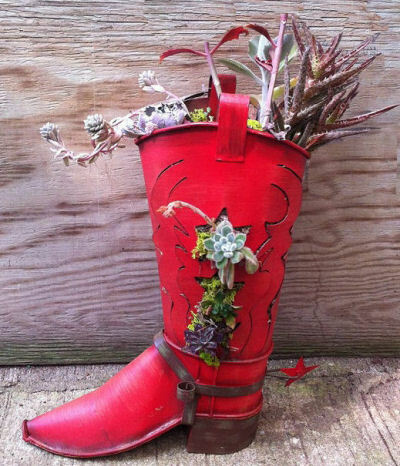 Shoes and boots make great planter ideas. Check out some more creative footwear planters here. 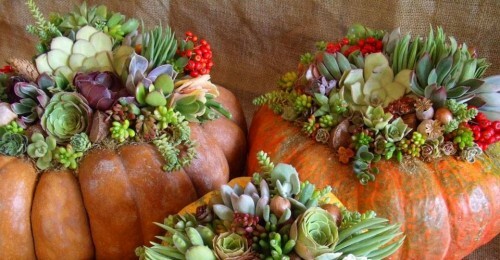 This idea is so creative and also perfect for the fall season when pumpkins are so plentiful. Just cut out the top of your pumpkins and remove the pulp. Add some soil and plant your succulents. Would love these on steps to the front door. Idea shared from Waterwise Botanicals. Are you the creative type? 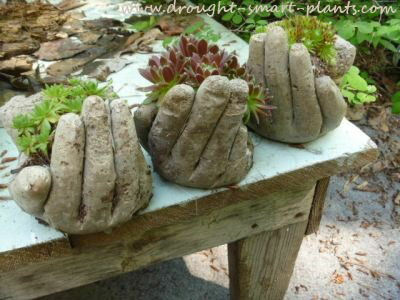 Then these DIY hypertufa hands might be just the project for you to make for a planter for your succulents. They require some surgical gloves, a bit of Portland cement powder, some peat moss and perlite and you end up with a one of kind creation. There is a bit of a learning curve with them but so worth the effort. Shared from my friend Jacki’s website Drought Smart Plants. Who comes up with something this creative? My friend Carlene, from Organized Clutter, that’s who. 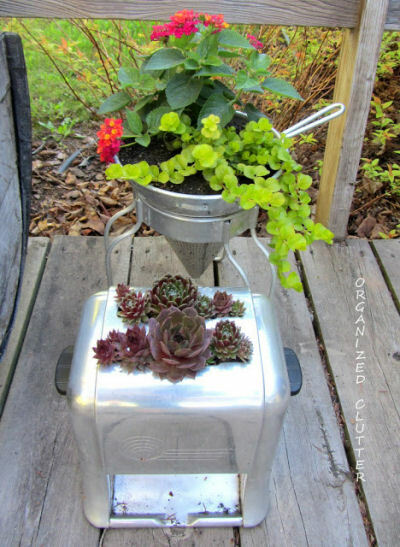 Carlene has not only this idea but 11 other inventive ways to plant succulents. Who would have ever thought to use an old toaster? See her ideas over at Organized Clutter. 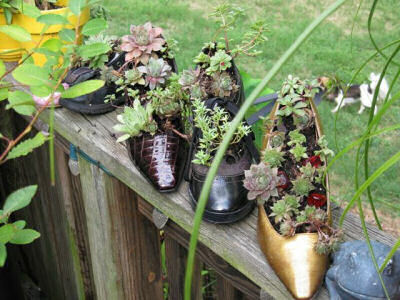 I’ve seen all sorts of shoe planters being used, but these shoes really seem to speak to to succulents. The planting area is small. Just perfect for a few plants that do not need much growing space. Idea shared from The Micro Gardener. This cowboy boot with the cut outs is one of my favorite creative succulent planters for the smaller types. The shape of the plant fit into the start cut outs perfectly, and the western theme also suits the dessert look of succulents. Shared from my article on The Gardening Cook. 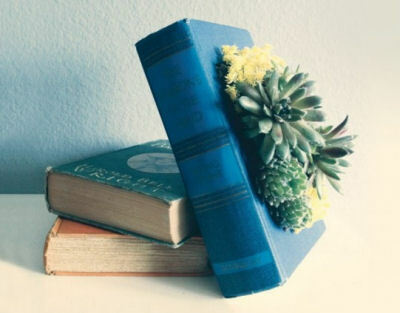 Vintage books turned into handmade planters—perhaps not for the book purists but still a great use of a book that is old and not so readable any more. These are made by Orange County Etsy shop owner Paper Dame. The planters are lined with a waterproof seal to keep your planter happy and useful for years to come. You can even request specific book colors or titles if you wish. 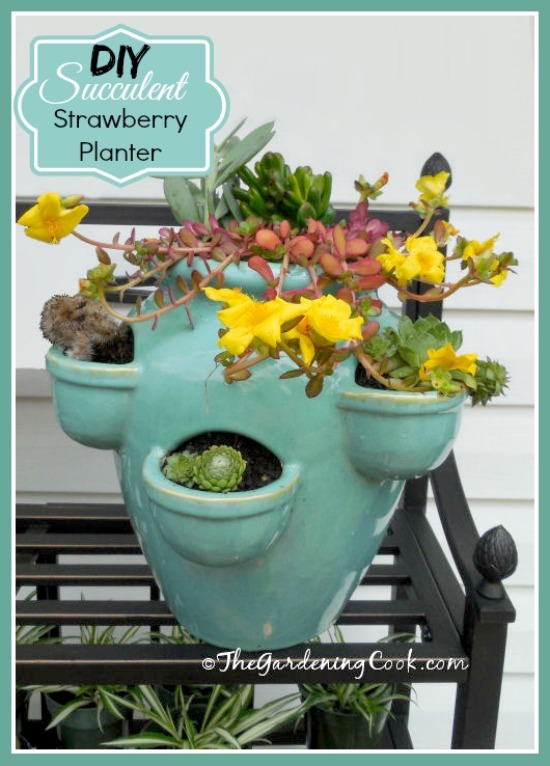 Strawberry planters are not just for strawberries. Those little side pockets are the perfect size for succulents and cacti. 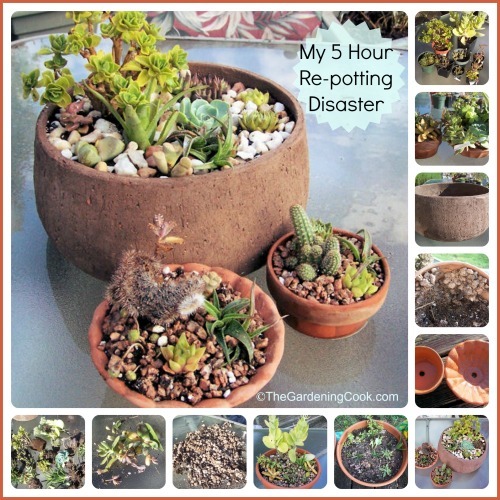 See how I re-purposed mine into a wonderful succulent planter. I recently spent most of a day re-potting my succulents but ran into a huge snag because of an unforeseen retail dilemma. See how I fixed my problem in this article. 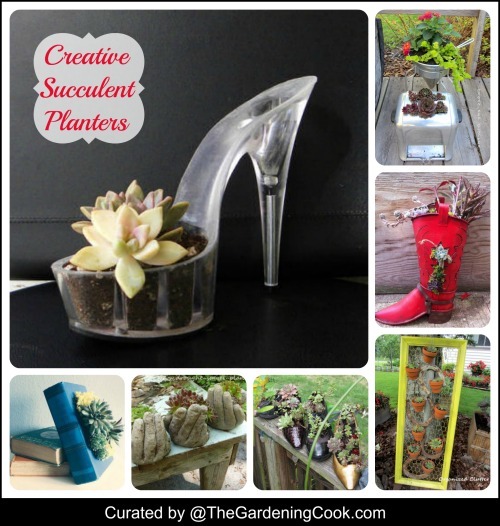 For more creative succulent planters, check out this post. What ideas do you have for creative succulent planters? I’d love to see your creations.